In 1962 the Aquastar brand was founded by Jean S. Robert in Geneva, Switzerland, and initially introduced as a sub-brand of the Swiss watch company JeanRichard SA. 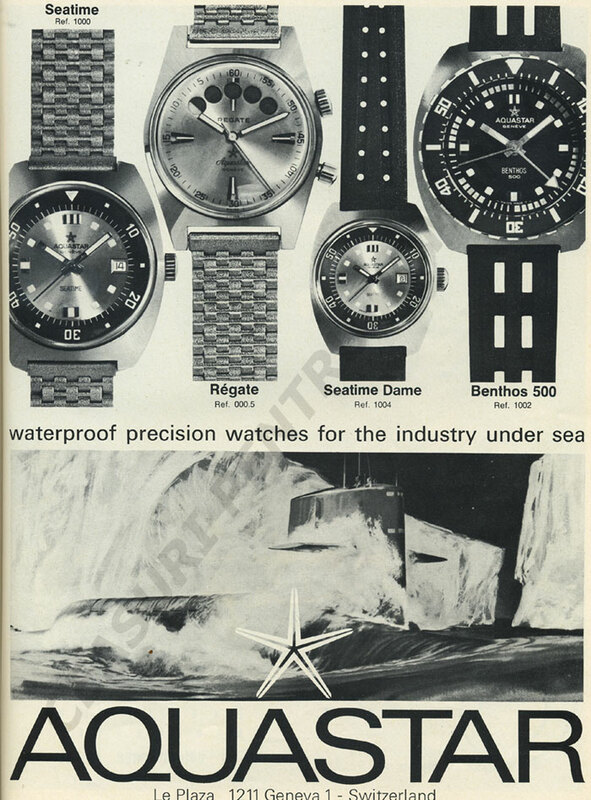 The brand was not only born from the passion of one man for the sub-marine world but was also reflecting a period where, for the first time, the sub-marine world became of interest. 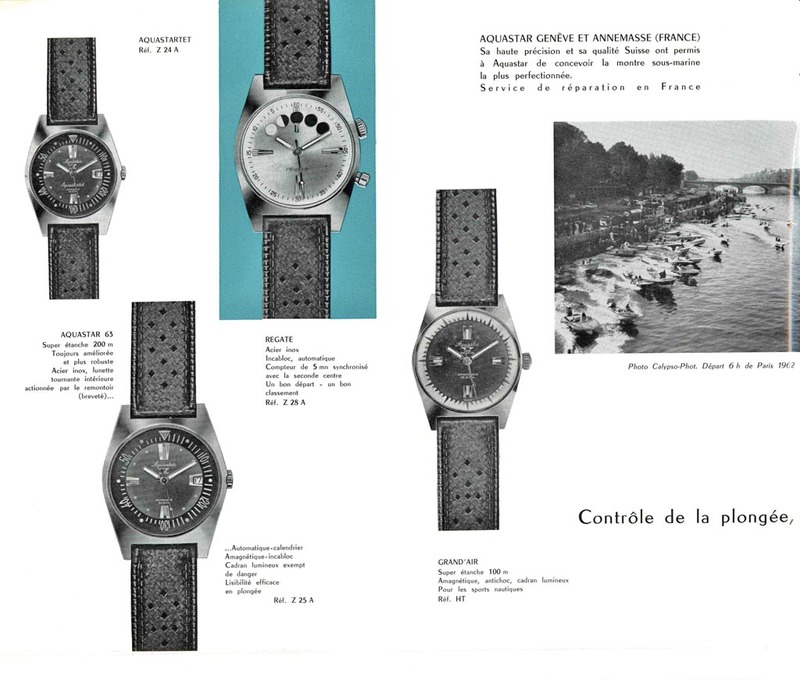 Already in 1958 JeanRichard had applied for a patent for a wrist watch with a turnable bezel. 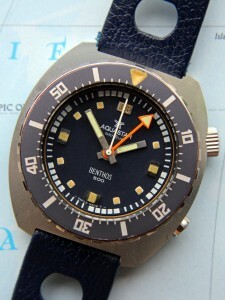 This patent let shortly after to the model JeanRichard Aquastar 60. 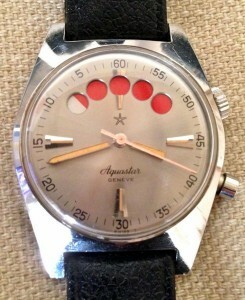 At first the Aquastar watches had both the names JeanRichard (or the JeanRichard logo) and Aquastar on the dial. 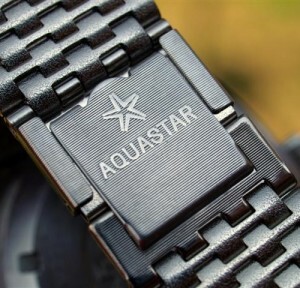 But soon this was dropped, and it became just Aquastar. With this first experience the development of other water sports watches followed, which made Aquastar the most important manufacturer in this field. The Aquastar Atoll , a regular diving watch with a ‘normal’ rotating bezel. 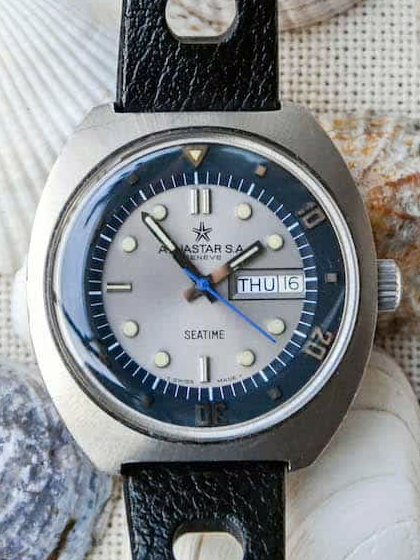 The Aquastar Seatime, with an internal bi-directional bezel with diver scale controlled by the same crown that sets the time. The Aquastar Benthos 500, with the case made of one single seamless piece of steel, the first diving watch water-resistant up to 500 m which put the diving watches really on the map! And the Aquastar Regate, the first Regatta Yachttimer wrist watch with the 5-dot countdown. 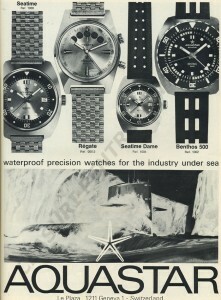 Examples of an Aquastar Atoll, Aquastar Seatime and Aquastar Bentos 500. 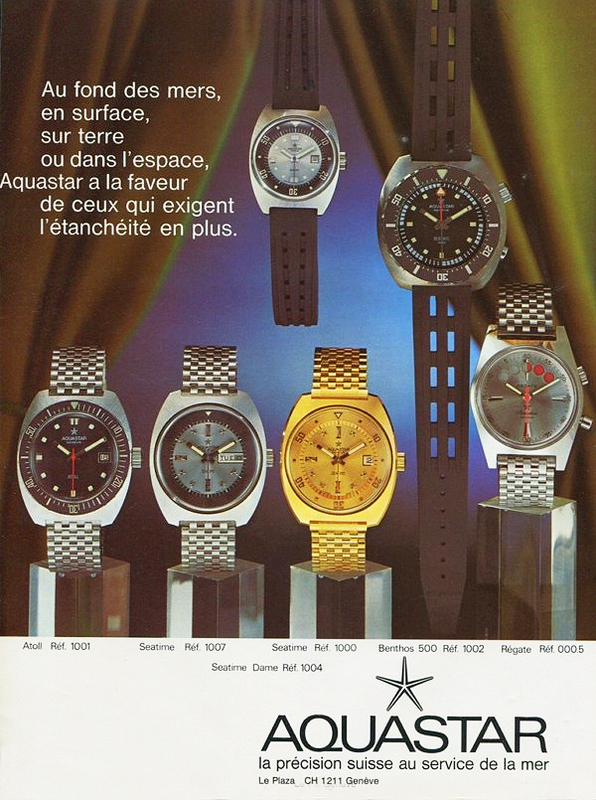 Various Aquastar advertisements with the Regate model shown. 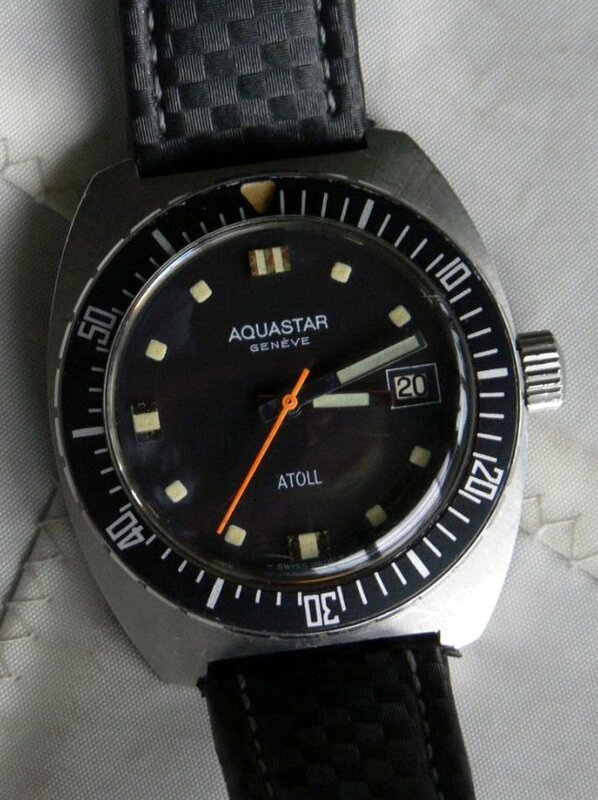 Only in the last two ads the watch has the ful name Aquastar Regate on the dial. In 1961 JeanRichard SA had filed for a patent for a regatta watch with a 5 minute countdown function. 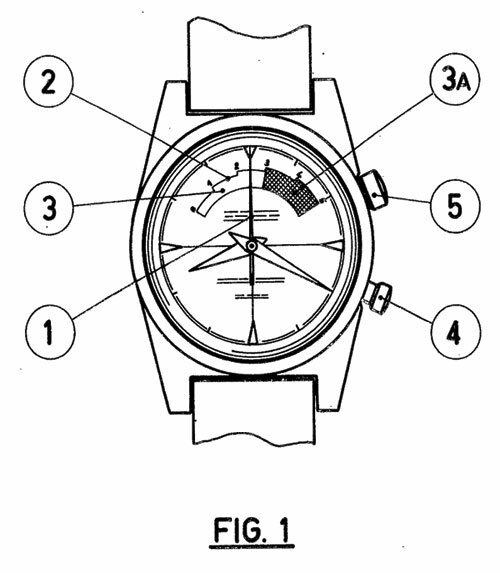 This patent represents the “Birth Certificate” of the regatta yachttimer watches as we still know them today. 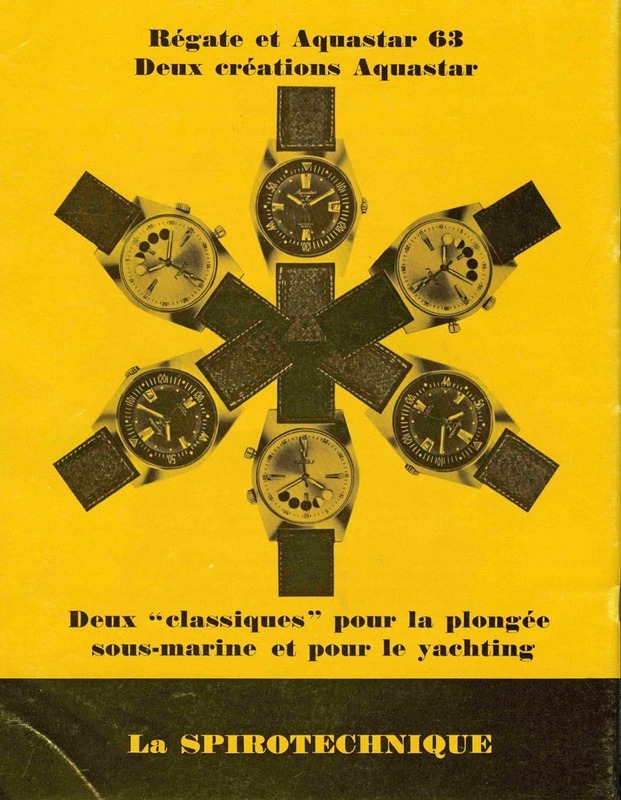 And somewhere in the mid 1960’s Frédéric Robert (mentioned as inventor in the patent) developed the Aquastar Regate from this patent with a modified Felsa 4000N movement: the first Regatta Yachttimer wrist watch on the market! 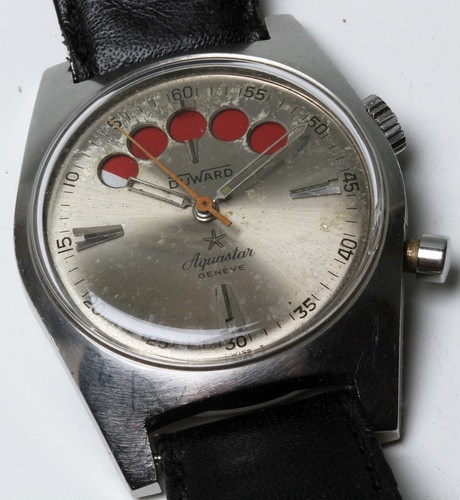 PIECE OF HOROLOGY ALLOWING THE COUNTING OF A RESTRICTED NUMBER OF MINUTES. 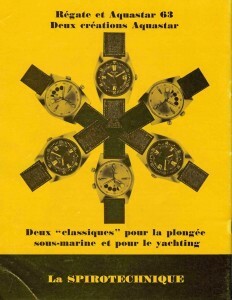 ‘The enclosed design represents, as an example, a kind of execution of a piece of horology being the subject of the invention. 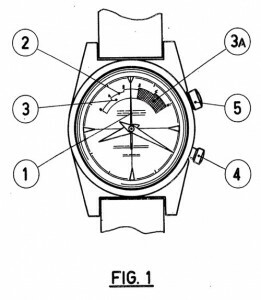 The figure 1 represents the watch as it appears to the user. The hand of the second 1 is located in the centre of the movement and the dial includes an opening 2 through which appears the surface upper side of an indicating organ 3, including a coloured zone 3A indicating in the graduation of the dial opening the time elapsed since the re-setting to zero of the hand of the seconds obtained by pressing the pusher 4, the crown 5 being used to rewind and to set the time of the hour and the minutes hands’. 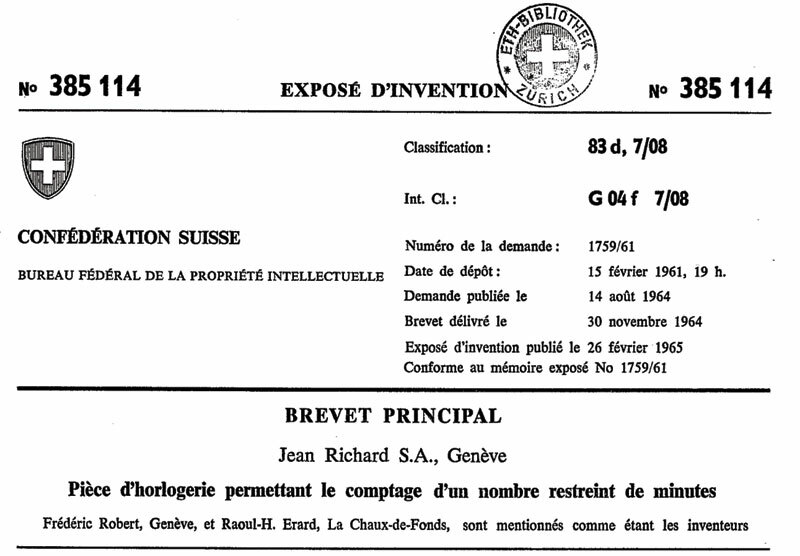 You can download the complete patent as PDF here. 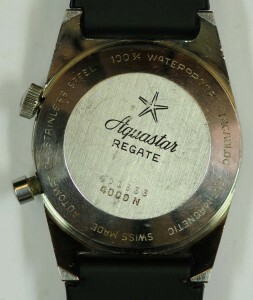 First model Aquastar Regate with the Felsa 4000N movement. Reference: Z 28 A or 143.600 or 000.5? 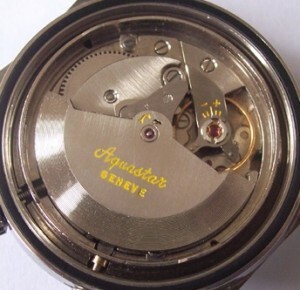 Caliber: Felsa 4000N movement with an Aquastar patented (1964) regatta module. 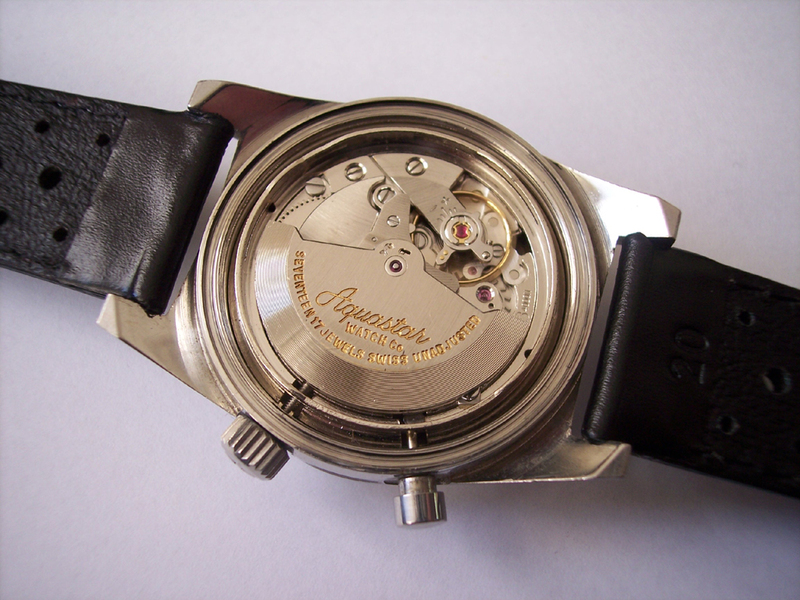 Case size: Ø 37,4 mm / H 13,5 mm. The manual wound Felsa 4000N movement with regatta modification, has the crown to set the time at 2 o’clock and one pusher at 4 o’clock for start/reset. 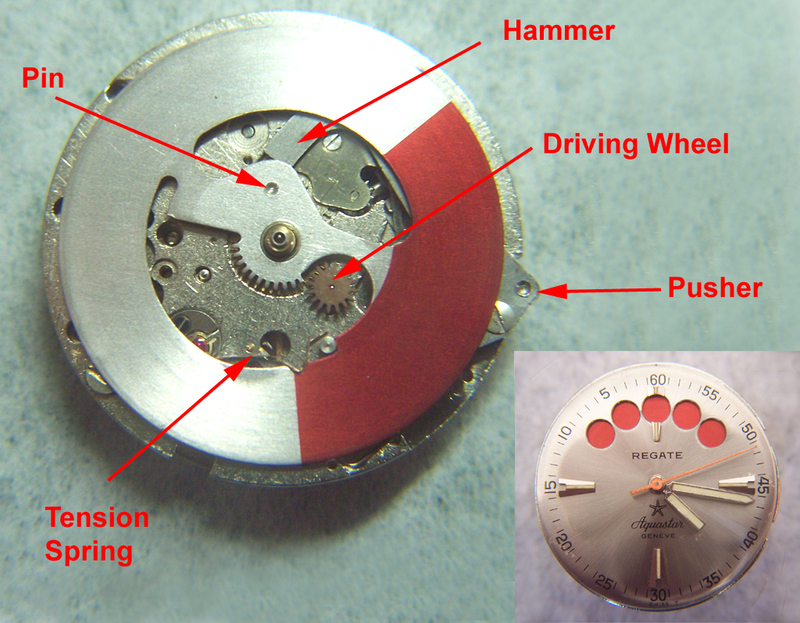 Under the dial lays the indicator disk coloured silver (as the dial) with a red section for counting the minutes. 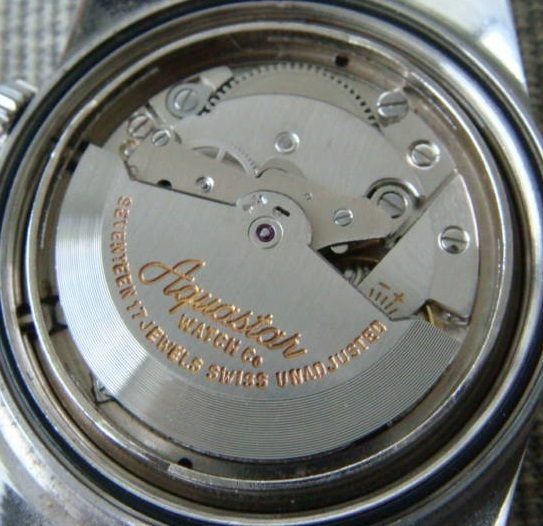 There are five round holes cut out of the dial, between 10 and 2 o’clock. After a reset the five dots colour red and the sweep second hand return to 60 (0). 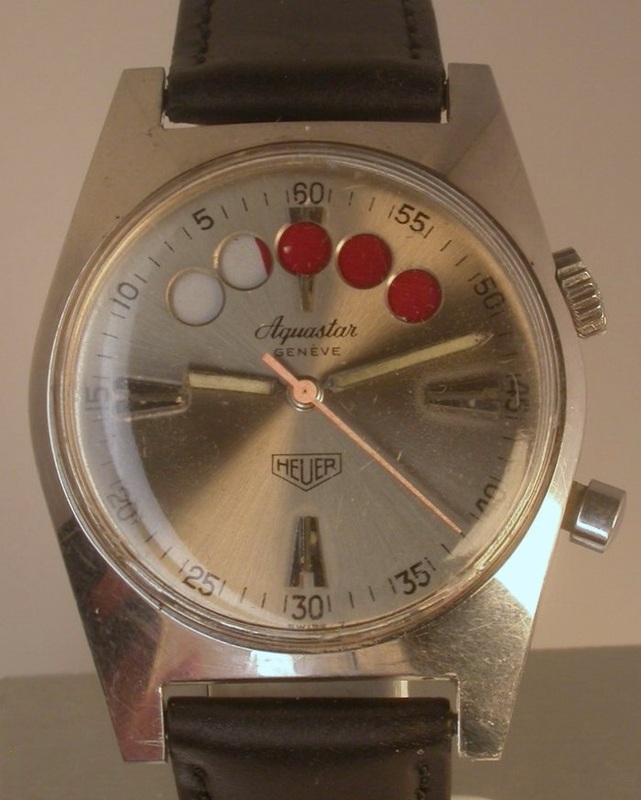 By releasing the pusher the countdown timer starts and the sweep hand is set in motion counting the seconds backwards from 60 to zero. After one minute the first dot changes to silver, another four minutes to go. 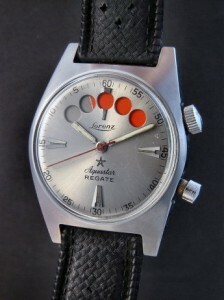 After 5 minutes all dots are silver and the regatta starts. 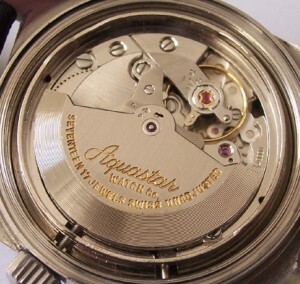 The indicator disk stops but the second hand will run as long as the movement is wounded enough. Size: 11,5″ Ø 26 mm / H 5,55 mm. Equal to the Felsa caliber 4000, but modified with a revolving indicator disk. 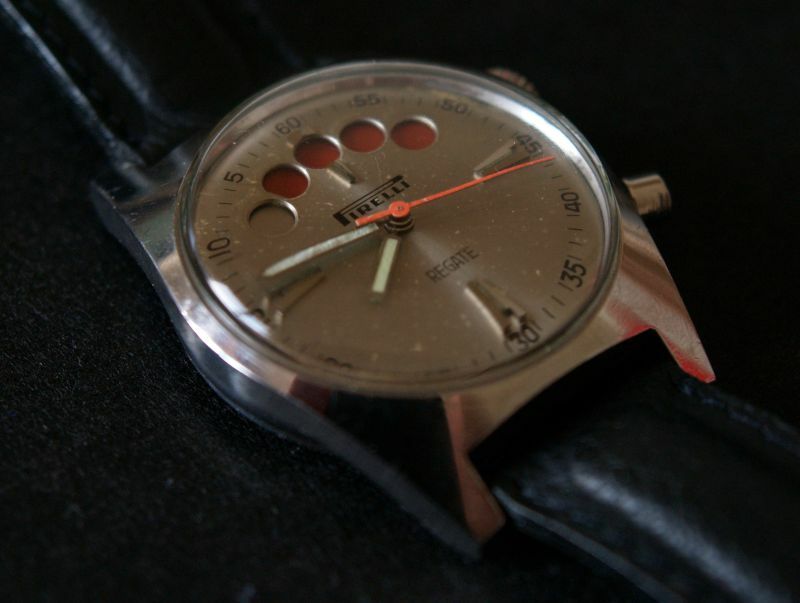 A nice description of how the Felsa caliber 4000N with the coloured indicator disk works, is written by Richard Askham on his weblog, see here. 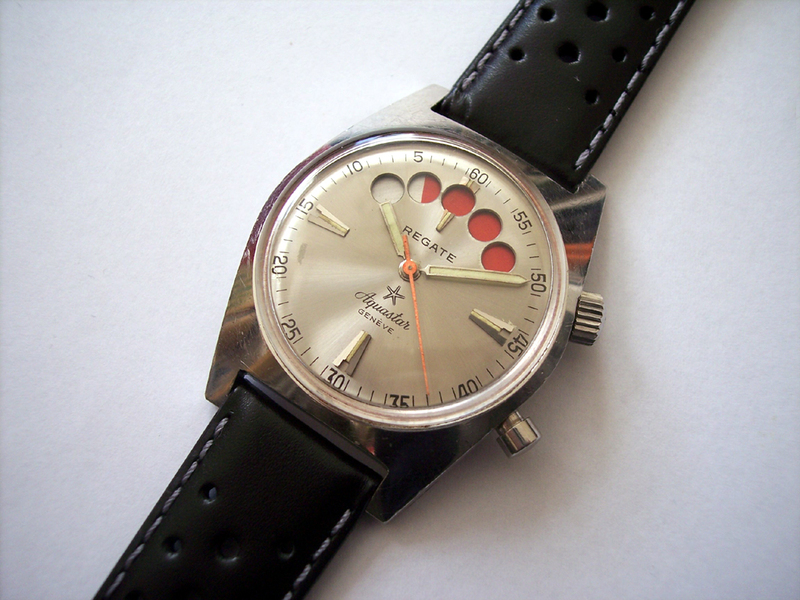 Two different dials. 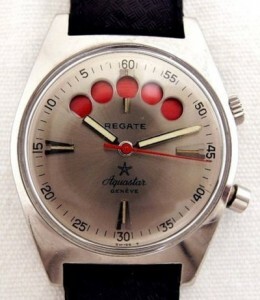 First, the more common with ‘Regate’ under the 12 and ‘star’, ‘Aquastar’ and ‘Geneve’ above the 6. Second, the more rare one, with the ‘star’ under the 12 and ‘Aquastar’ and ‘Geneve’ above the 6. Two different rotors. 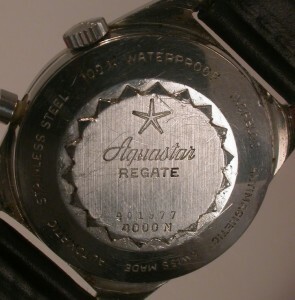 Left engraved with the text ‘Aquastar – Watch Co – Seventeen 17 jewels Swiss unadjusted’ and right with just ‘Aquastar Geneve’. The last one is probably older. 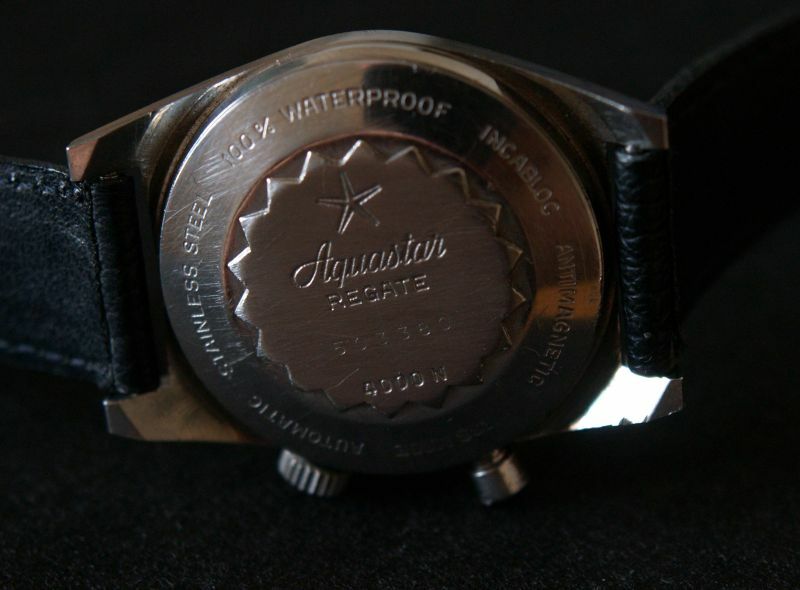 With an original 19 mm NSA steel bracelet, signed Aquastar. Co-branded Aquastar with Duward, Lorenz and Heuer. Branded ‘Pirelli Regate’ on the dial, but ‘Aquastar Regate’ on the caseback. 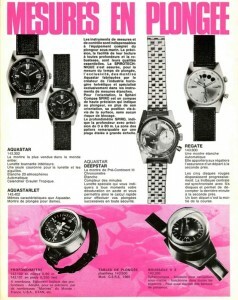 You will find a variety of colours for the sweep second hand: from orange, red to more pink-like. Probably this is due to the combination of aging and sunlight. 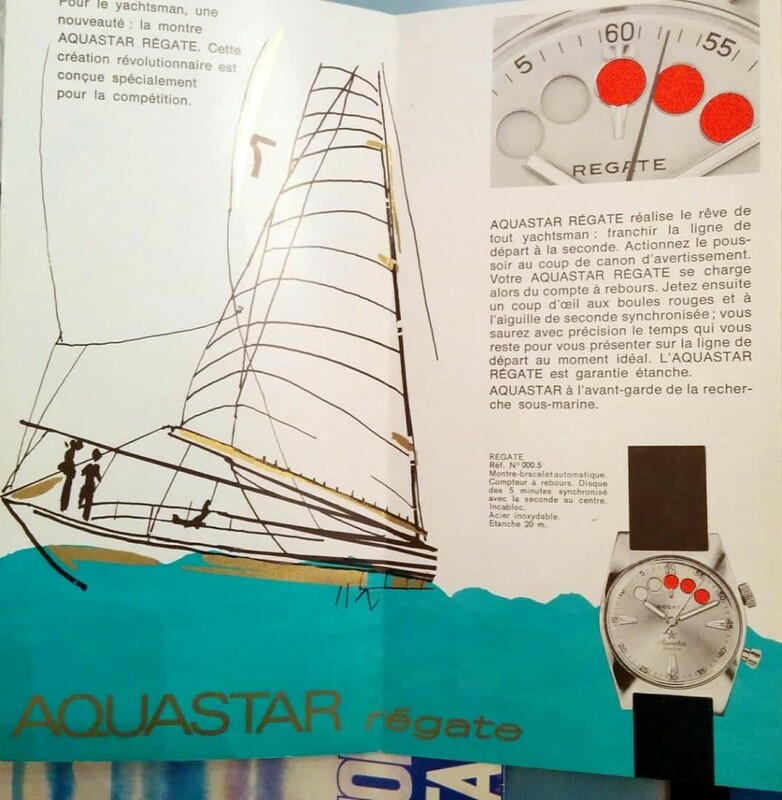 Decorative brochure for the Aquastar Regate, reference number 000.5. This is the end of part 1. 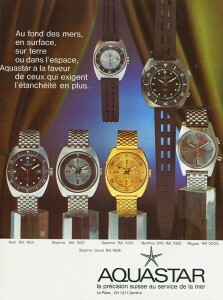 To be continued in the Aquastar 1970/1980’s section. many thanks to Christophe Gosteaux (www.atelier-horloger.fr) for your picture of the Aquastar brochure.